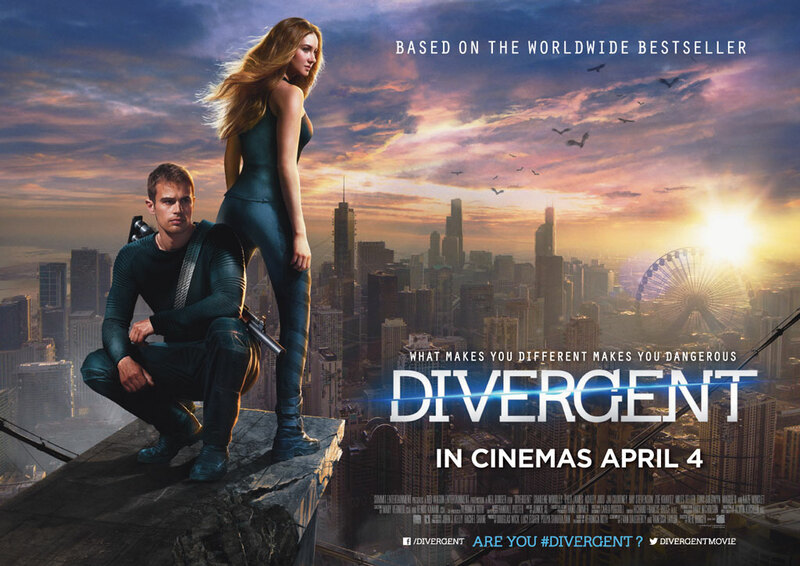 Giveaway – Win Tickets to the DIVERGENT European Premiere! Holy wow do I have something exciting to post about today dear readers! The European premiere of DIVERGENT is at Odeon Leicester Square on the Sunday at 1.30pm, attended by stars of the film Shailene Woodley, Theo James and Kate Winslet! So not only can you discover the world for yourself, you can walk the red carpet, mingle with the stars and watch the film before it’s released in the UK! Enter here for your chance to win this once in a lifetime experience. If you aren’t lucky this time, you are still in with a chance – get down to Leicester Square early as there will also be a limited number of premiere tickets given away to fans on both days. Poll: Do you Write in Chronological or Non-Chronological Order? Thankyou! good luck to all! who doesn’t want to go to a fantastic premiere? haven’t read the book but would love to see the film…. I am SO excited for this! Going to try and get a glimpse of the stars in Leicester Square even if I don’t win tickets, I’ve got to find out what Faction I’m in! Thank you for the opportunity to see my favourite book come alive into film. I really enjoyed the books and I love all the characters especially Tris. I really cant wait to see Divergent. I want to desperately win tickets to the Premiere as I’m going to Leicester Square anyway from 6am to try and get to see the stars, I also want to know what faction I’m going to be in and I am a MASSIVE fan of the book so I want to see how they do the book/film adaption! i’d make my son a very happy bunny and i’d get to see what all the fuss was about! Would love to go to the premiere. I’m a huge divergent fan and divergent myself! to be in the thick of things at a premiere sounds excellent! Guess how much I want these tickets! This premier has been on my calendar since it was announced! So excited and it would be even better with tickets! I love to win because Divergent is my favourite YA dystopian novel (the first book) and I am super excited to see it come alive on the big screen! These tickets would be amazing!!! Wow what an offer – one you can’t get with love nor money! I live in London so I’m on hand to jump down to Leics Sq and catch this movie early, I devoured all 3 books in practically a single weekend… so excited for the film and would love to go! It’s my best friend’s favourite book series! She’s so excited for the film – she’d DIE if I won this for her!!! This would be a gift money can’t buy for a very special friend who has been so kind to me. I would like to win because Divergent is my favourite book and I absolutely adore all of the actors and actresses portraying my fave characters!I would love to win this because I have never been to a movie premiere before and it would be amazing for my first one to be of the adaptation of my fave book! Also, you cannot buy these tickets so this is my only chance, thank you! Winning is fun. Randomness is fun. I have waited for divergent to be turned into a movie so long. I think that the cast is perfect and I know that the franchise will be massive. It would probably be the most amazing thing that has ever happened to me on my life of I won these tickets. I want to win as it would be AMAZING to go to a London movie premiere! I would love to win because I adore the books and I’m so excited about seeing them brought to life. It would be amazing to see the film at the premiere in London! I’m a huge fan of the books, and am really excited to see Dystopian Chicago come alive! Looks like its set to be an amazing premiere, and of course an amazing film!! We at booktuation are huge fans of the books and would love to see the transformation from page to screen. Thanks for the opportunity to win tickets – cant wait to see the film! Who wouldn’t love the chance to attend a film premiere!? Amazing giveaway! This post has made my day- I absolutely LOVE the books and have read them all loads! I was so upset that I didn’t manage to get tickets before, so another opportunity to go to the premiere – to see Shailene Woodley and Theo James… It would just be incredible. would love to win to soak up the atmosphere of a red carpet premiere! I am entering this in the hope of winning tickets so I can take my daughter, who is a BIG fan! I want to win because I love The divergent series so much and I think it would be incredible to get near to theo and shai. I would love to win because I would love to see the book brought to life at the premiere ! And it’s not just any other premiere either ! They’re completely creating the world of Divergent !! Fantastic !! My daughter absolutely loved the books and she would be so excited if I could take her to the premiere. We just cant wait till April 4th !! I would love to win as my daughter is a huge fan and she’d love to go! I would love to win as I’m a huge fan of the books and I’m a massive film junkie so it will be an amazing experience to be able to go to the film premiere of one of my favourite book series! I am sure this is the next big franchise to replace Harry Potter and take over from The Hunger Games when it ends next year so I would love to go to the premiere! It’s so cool that you’re able to give these tickets away!! The Divergent trilogy is my favourite so i’m super excited to see the film!! I’m a huge fan! I’ve met Veronica Roth and she signed my copy of Allegiant, and I was close to Shailene but she couldn’t stay unfortunately. I would love to win so i can take my best friend who waited an hour for me to finish a test so we could watch the vampire diaries together, so i want to return the favour and go to the premiere as she’s going on holiday but wants to see it with me before then, plus her birthday’s coming up so that would be extra special!! Also i watch a lot of book tubers so it’s great to find another book blogger and an author at so young!! I must look out for The Elites!! I would really really like to win the tickets because I am myself a divergent too. I have never one any thy competition like this and it would mean the entire world to me if I one those tickets. In a way I know this sounds weird but after reading the books it’s made me feel more confident in myself and u know that I can do anything be anything and be brave. So I would really really like to win these tickets but I know i probably won’t anyway but please make my dream come true. This would be a fantastic Mothers Day outing. I’d love to walk the red carpet! I would like to win, because this looks like an awesome film with great cast! I would love to win because Im a massive Divergent fan! It is also a dream of mine to meet Theo James, hea definitely my celebrity crush! I’ve read the divergent books five times, they’re my favourite books ever and i’m reading them for a sixth time and currently on the second book! i’ve never been to anything like this before so if i win it’ll be the best thing ever! i’ve just turned 18 so this would be a cool way to celebrate! my favourite character is Eric (jokes!!). it’s a tough call between Tris and Four! Would love love love to see the actors and even if i do not win i’m excited to see how they’ve adapted the books into a film! Exciting stuff!! I realy hope I win! My wife has always wanted to attend a red carpet premier…so this is for her.